One thing teachers can easily get ahold of is 1/2 pint milk cartons. Here is a project that’s easy and a way to send lots of empty milk cartons home. What kid wouldn’t want to make a passel of these. There’s always room for a few little extra Halloween decorations in the home or at school. And once you start making them you can think of lots of different ways to decorate them. Google eyes, long accordian pleated legs, etc. 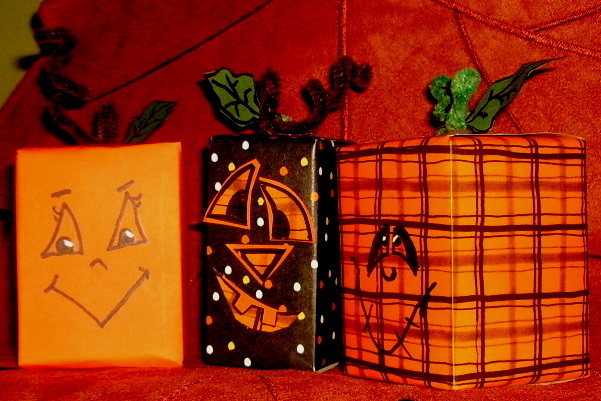 Directions for this project, “Milk Carton Pumpkins,” is in the Halloween Projects Gallery in the sidebar. This entry was posted in Halloween and tagged crafts, easy, easy halloween crafts for kids, for kids, Halloween, halloween crafts, halloween crafts for kids, halloween decorations, halloween projects, jack-o-lantern, milk carton pumpkins, milk cartons. Bookmark the permalink.